Peacefully on Saturday, December 1, 2018, after a lengthy battle with cancer, Albina Curé passed away at the Lac du Bonnet Personal Care Home with family at her side. Albina, better known as Bin, leaves to mourn her three daughters and three sons: Donny, Donna Lee (Glen), Della (Randy), Danny (Audrey), Doug and Doris (Pete), grandchildren Amanda (Mike), Jonathan (Tara), Tyler (Darcie), Brett (Chelsey), Melonie (Clinton), Luke (Christina), Jodi (Corey), Emma, Jaydan, Kylie (Andrew), Parker and Bennett, great grandchildren Ashton, Tessa, Cason, Kylin, Hailey, Hunter, Hayden, Chantal, Rowan, Shayla and Kinley. She also leaves to mourn her sister Marguerite Lodge, brother Fred Curé (Rena) and numerous in-laws, nieces, nephews, and friends. Bin was predeceased by her parents Corona and Camille Curé, husband John, special brother in-law Marcel, brothers Camille and Leo, sisters Rosaline Anderson, Clara Steeves, and daughter in-law Pat Curé. Mom had a few odd jobs throughout her life but was mostly just busy raising her six children. She spent countless hours sewing and repairing clothes, as well as knitting things for us and many others. Knitting was her favourite hobby-she knitted up until her last week. Everyone who knew Mom knew that she loved her family and friends and would do anything to help out, often sewing, repairing or knitting something for them. Mom loved a good game of dice or cards and it was sure to bring a lot of laughs from everyone who played. Spending time at the cabin at Booster Lake was another pastime that Mom enjoyed, bringing back memories of the times she spent there with Dad on the trapline or picking wild rice when we were kids. 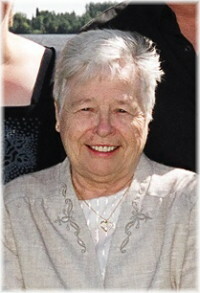 Thunder Bay was like her second home where Mom spent many summers at the lake with Marcel. From a young lady to an adult, Mom loved to bake bread, pumpkin pies, and her wild rice stuffing was loved and enjoyed by family and friends during the holidays. Special thanks to Dr. Bruneau, Pinawa Hospital and all the staff at the Personal Care Home. Viewing will begin at 6:30 p.m. with Prayers being said at 7:00 p.m. on Friday, December 7 at Sobering Funeral Chapel, 1035 Park Avenue E., Beausejour. Funeral Liturgy will be celebrated on Saturday, December 8 at 11:00 a.m. also at the Chapel. Interment in the Lac du Bonnet Cemetery will follow a light lunch. Pallbearers will be her grandsons Jonathan, Luke, Tyler, Brett, Parker and Bennett. She was our rock and now she is our Angel!